Way behind schedule for other tasks, so I only managed to analyze FKLI in-detail. 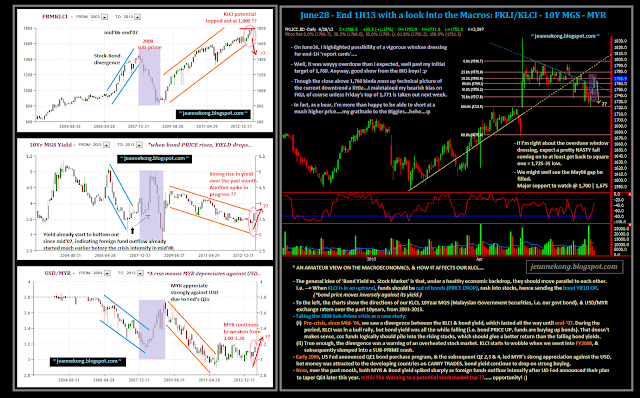 Anyhow, I hope my readers have benefited from the rally, when I gave the heads-up on my June26 (Wednesday) 'Quickie on FKLI'. For the weekend, & also to close the 1st Half of FY2013, I did a thorough research on the fundamental financial status of our market. On CPO, the fall accelerated in the past week, confirming a solid breakaway from the previous strong rally sentiment. Immediate support comes in at 2,335, which has yet to be violated although price closed the week near low around 2,340. Shall the 2,335 support holds, I'll expect a bounce from that level, starting a corrective rally towards 2,350-60 | 2,400-20. 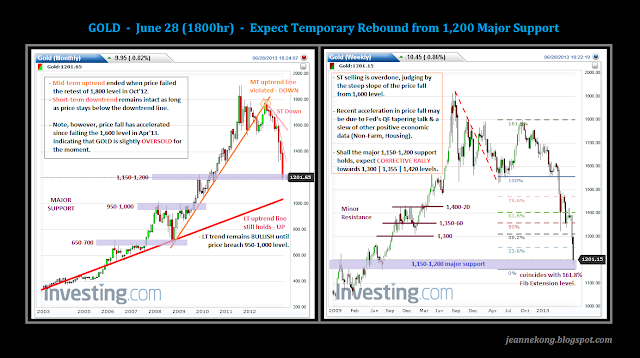 Not too worry though, as I've got a GOLD chart from late Friday (June 28) evening, before it bounced from 1,200 support & closed high at 1,233.75 in a bullish candle. Talking about Non-Farm Payroll (NFP), the June'13 reading will be out in the coming Friday (July 05). A must-watch for GOLD traders, in fact, price may stall in tight range in anticipation of the data release next week. For your weekend pleasure, I'd like to share a video with you, who is reading this post. A short 4-minute video (in Cantonese), a small story, but a real BIG inspiration! On another note, I mentioned The Apprentice Asia Ep.5 has the teams trade CFD virtually. Enjoy the weekend, free of haze ! !